So I just took a look at my calendar and realized Valentine’s Day was on Thursday (ahem…rushes to store to buy a card) but to be honest I can’t actually believe I ever forgot. Mostly because of the BOMBARDMENT of candy, chocolates, and heart shaped everything right before the checkout at every single store right now. Another reason why I like to do my shopping online - to avoid the impulse buys!!! Right now, I’m all about trying to find healthy alternatives so that I don’t have to miss out. My kids and hubby (and his size 33 waist no matter how much I shovel onto his plate) will undoubtedly be treated to a chocolate or two - but I’ll be trying to avoid it as much as I can this year. Mama’s got goals in mind and when I cheat I make it worth it (LOL AKA PIZZA YA’LL). So what does one do when trying to think of treats to satisfy that sweet tooth on the day of looooove? Hit up Pinterest, of course. Didn't take me long to find a couple of great alternatives to sneaking a couple Hershey kisses (okay fine, the entire bag). The best thing about these treats? Minimal ingredients and easy as hell to make. YAS. These Strawberry & Yogurt Bites would take you a total of 5 minutes to prepare (and then freezer for a couple hours until they’re set). Also, shoutout to Produce For Kids for keeping it easy on the moms to make - 3 ingredients? Preachhh. Mix it all together and scoop the mixture into a cute little heart mould (like the one below, from Amazon!) and freeze for a couple of hours to make little heart shaped treats! Love this idea too! These mini yogurt parfaits are so easy and again, only a few ingredients and prep time is 5 mins. That’s the real treat TBH. Use each ingredient to create layers in a little cup or bowl. As an option, you can use red food colouring to dye the yogurt pink or red to make it a little more festive. 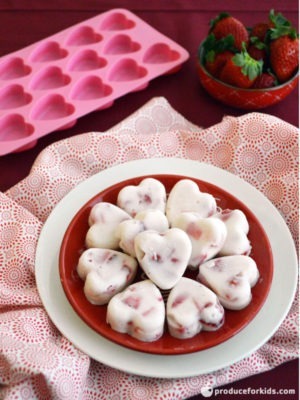 Even top with a few pink or heart shaped sprinkles and you’ve got an easy, healthy treat! A couple more easy treats: the classic chocolate covered strawberries (you could use dark chocolate instead) or substitute the chocolate for light whipped cream instead! Better yet, just take snacks that you already enjoy, cut them into a heart shape and call it a day LOL.